This disc contains two very different oratorios. The first is one of only two setting an Italian text, instead of Latin. It seems to be an early composition, as it is stylistically rather close to the works of Monteverdi. The two violins play the Sinfonia with which the oratorio opens, some ritornellos and also take part in the choruses. This oratorio has only one protagonist, the Virgin Mary. The first part describes how Mary fights the devil and beats him, the second part is a jubilation about the Virgin's victory. Whereas this oratorio is a meditative piece, the second is much more dramatic, as it tells the story of the prophet Jonah, who is ordered by God to tell the people of Nineveh to turn away from their sins and convert to God. Jonah tries to escape on a ship, but God causes a storm. In order to save their ship and their lives the sailors throw Jonah into the sea. He is swallowed by a fish and cries to God from the belly of the fish. God orders the fish to spit him out on a beach. He goes to Nineveh and the people of the city convert to God, which is expressed in the closing chorus. Carissimi makes use of the 'cori spezzati' technique, and the parts of the violins are more extended and virtuosic, in particular in the closing chorus, than in the Oratorio della SS Vergine. 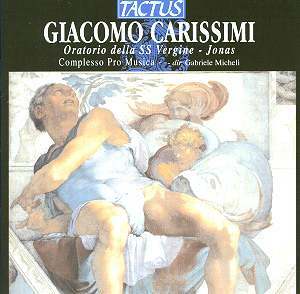 Unfortunately this disc can't be considered a worthwhile contribution to the discography of Carissimi's works. This is not the only Tactus release where I have to complain about the technical quality of the recording. Throughout the disc there are many background noises, like turning pages, which suggest a live recording. But there is no mention of this. If this is really a studio recording, than these noises are unacceptable. And this disc also has crackles as if it was an LP. The interpretation isn't much better than the technical quality, I'm afraid. Most voices are stylistically more at home in the 19th century than in the 17th. They are apparently trained to produce sound rather than text. It is hardly surprising, then, that they don't blend very well. The tempi are much too slow. Some time ago I reviewed another recording of this oratorio, by the Consortium Carissimi (Naxos 8.557390), which I wasn't satisfied with either, but the difference in duration of 'Historia Ionae' between the two recordings is revealing: the Naxos recording takes just 10 minutes less than this one. Due to the slow tempi there is little real interaction between the characters, as there are gaps between the dialogues are far too long. One of the features of the choruses in Carissimi's oratorios is the repetition of motifs at different pitches. The dramatic effect of this compositional technique is completely lost here, due to the slow tempo and the undifferentiated loud singing. The violins play very well - the only aspect of this recording that I really enjoyed. There is so much wrong with this disc - musically and technically - that the fact the booklet has no translation of the lyrics doesn't really matter. Musically this is a missed opportunity to make a meaningful contribution to the growing interest in Carissimi's oeuvre. It is time the producers got their act together. One can't expect people to buy discs when they are likely to be technically deficient.